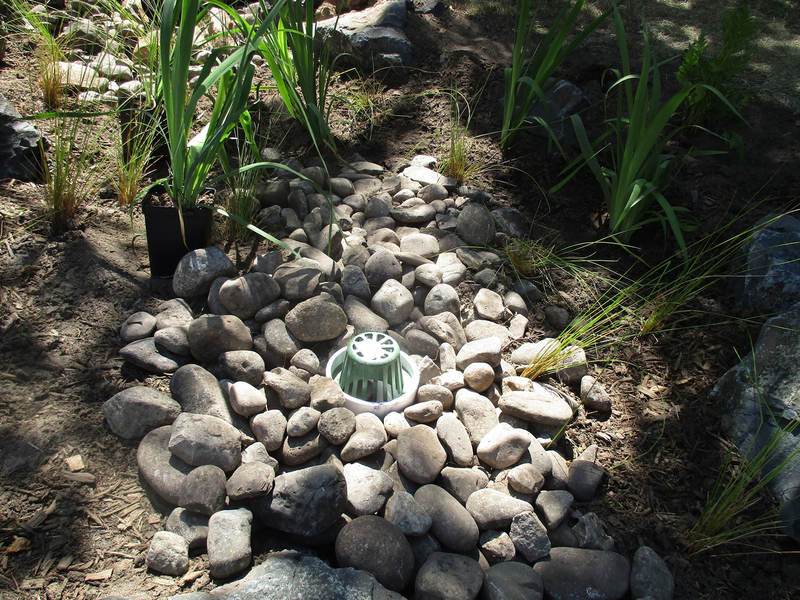 Designed as a rock garden, the rain garden can mimic a streamside habitat, with native ferns, wildflowers, and a few small trees. 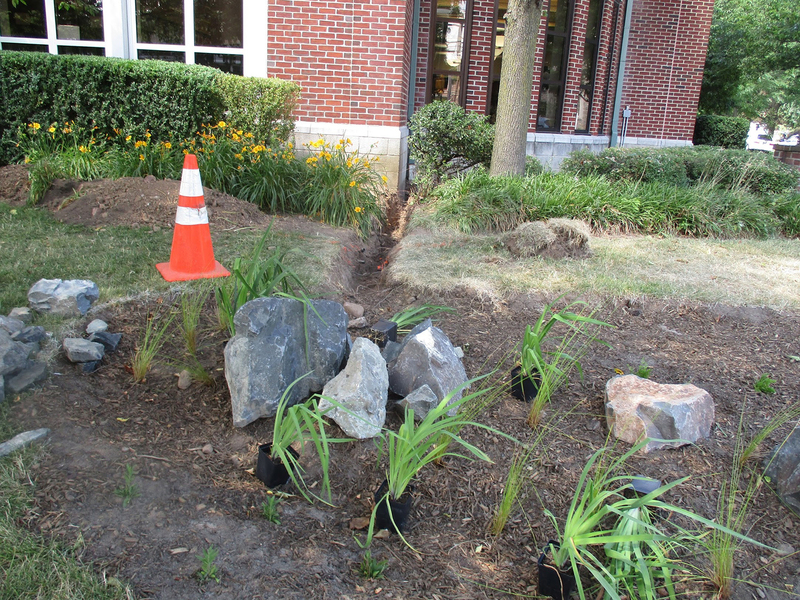 Like many natural streams, the rain garden fills up when storm water runs off a rooftop. 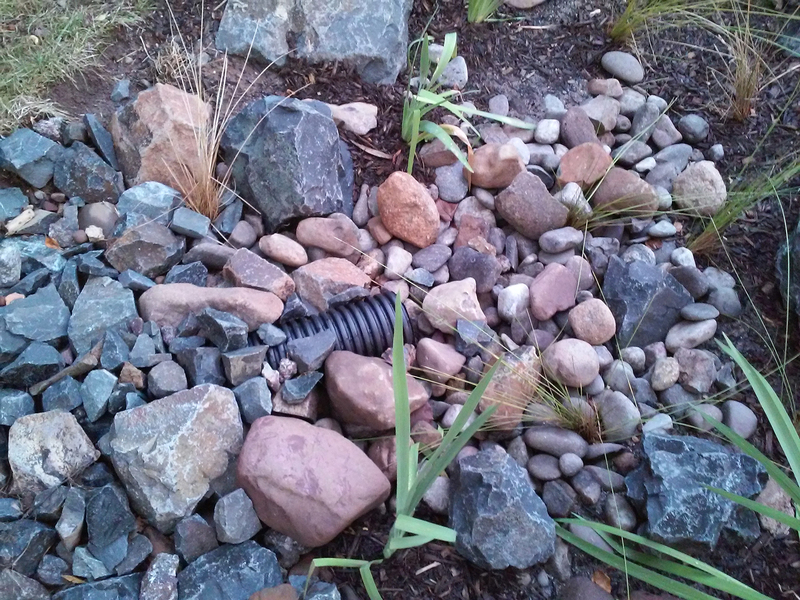 But unlike a natural stream, whose banks are eroded by a flush of stormwater through an outfall pipe, the rain garden retains the run off, allowing it to slowly filter into the ground. This clean groundwater keeps wells from running dry, maintains the base flow of streams during dry spells, improves habitat for fish and wildlife, and provides drinking water for residents of the watershed. 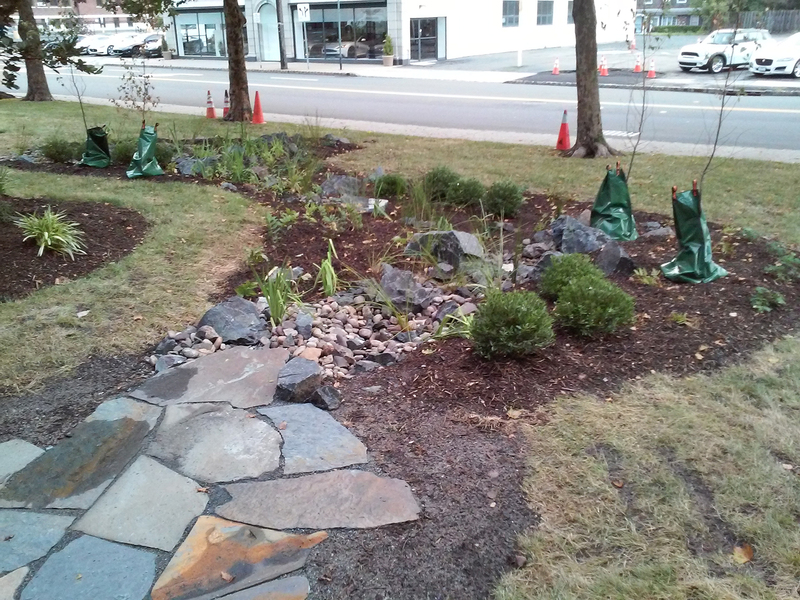 It’s the dawn of a new era, as this lawn by Summit’s City Hall, and two areas around the Summit Free Public Library are transformed into beautiful, beneficial rain gardens. 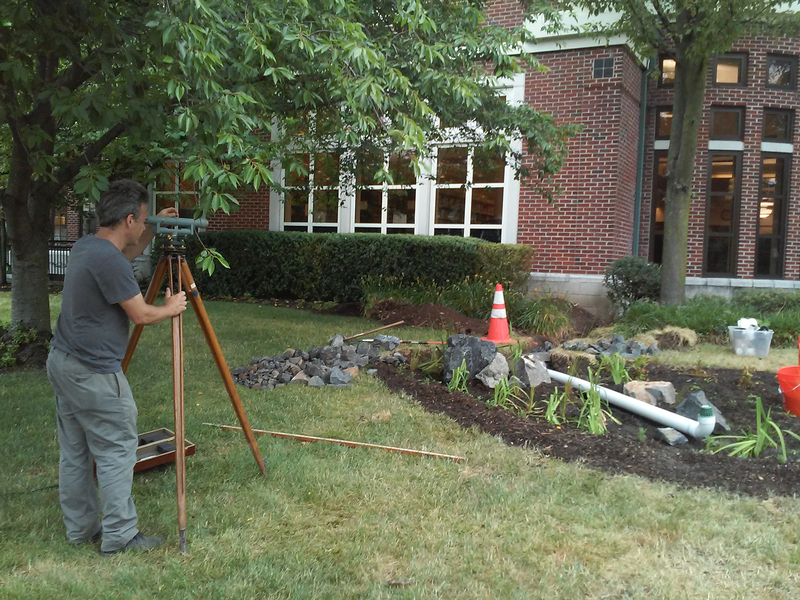 There is more than meets the eye going on in this element of green infrastructure. The first step is to calculate the volume of storm water that the rooftop will deliver in a “once in 10 years” storm. 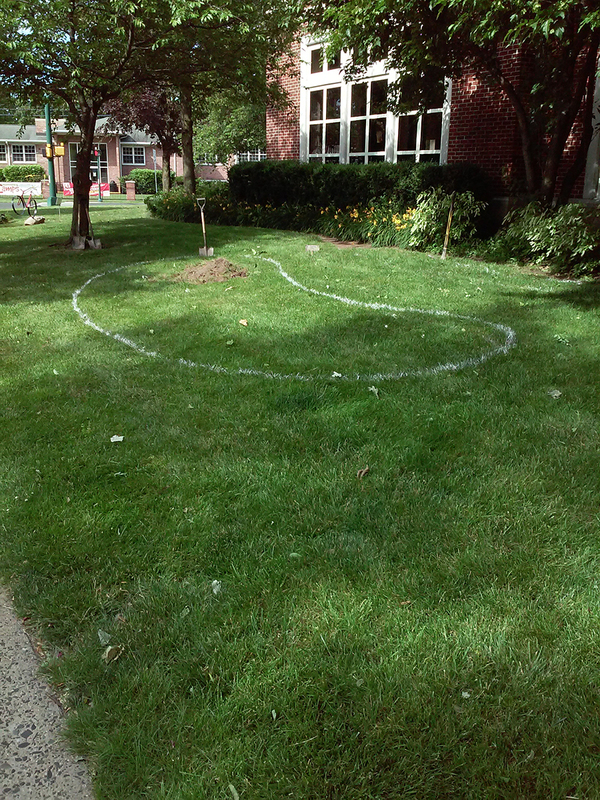 This, along with the permeability of the soil determines the size of the rain garden. 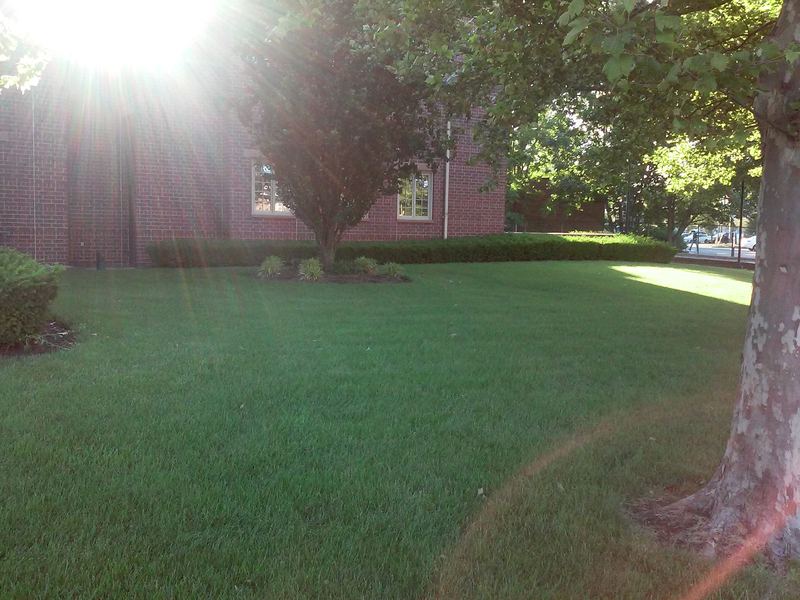 The garden is placed at least ten feet from the building. 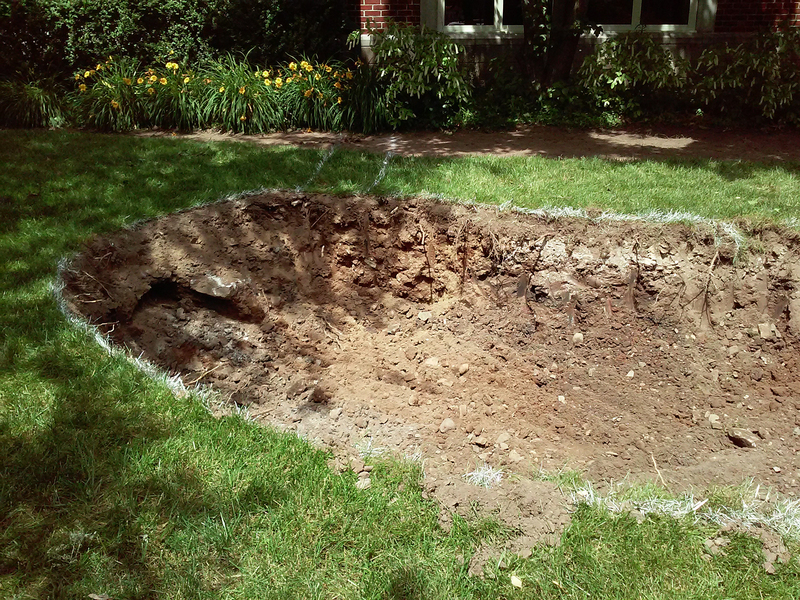 The soil is excavated to a depth of at least 2 feet. 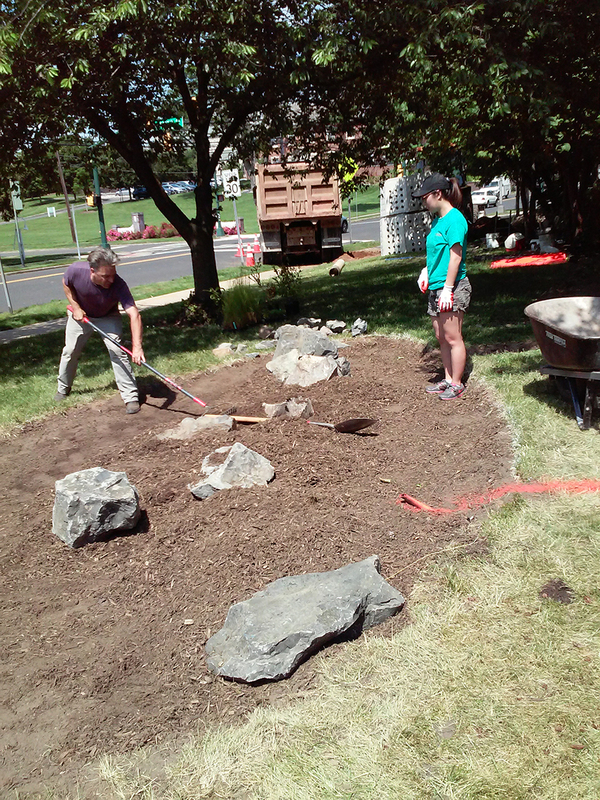 The basin will be filled with “bioretention mix” which is 4 parts sand, 2 parts compost and 1 part loamy soil. 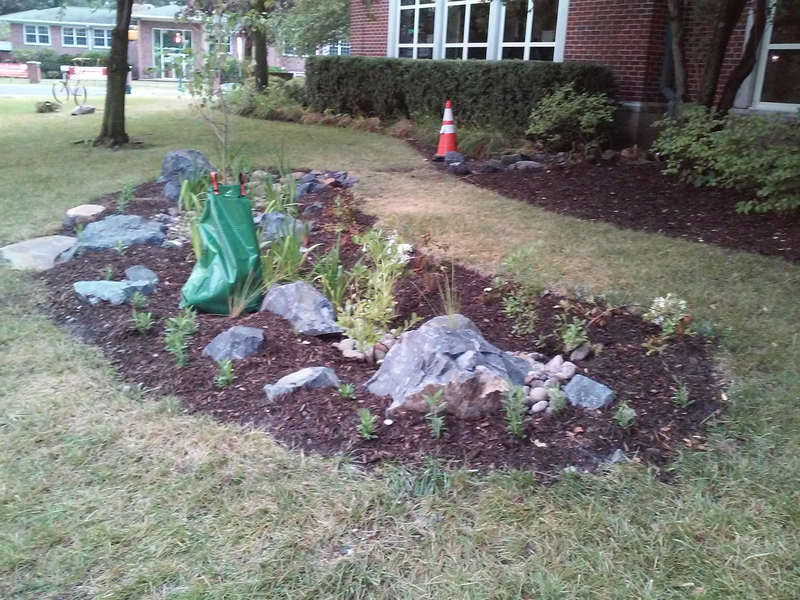 The rain garden is placed at least 10 feet from the building and connected to the downspout by a trench. 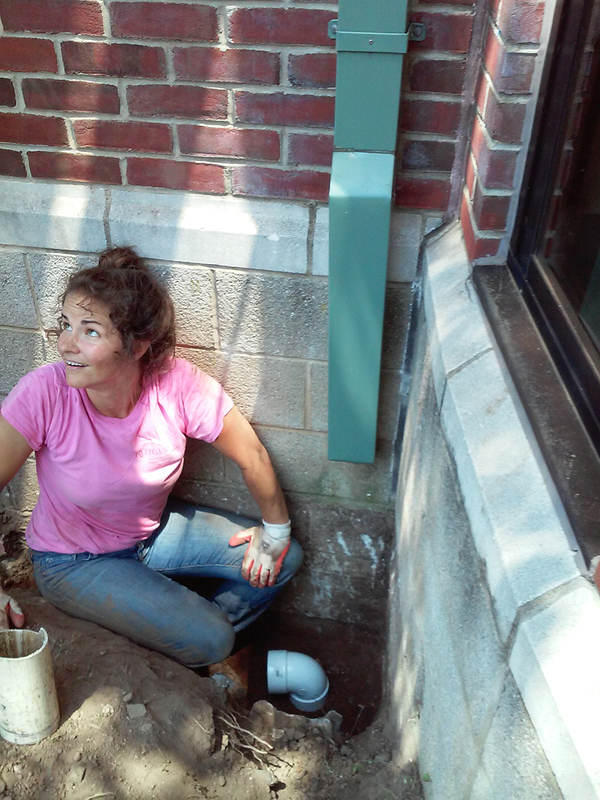 Stormwater from the downspout is piped into the garden through the trench. 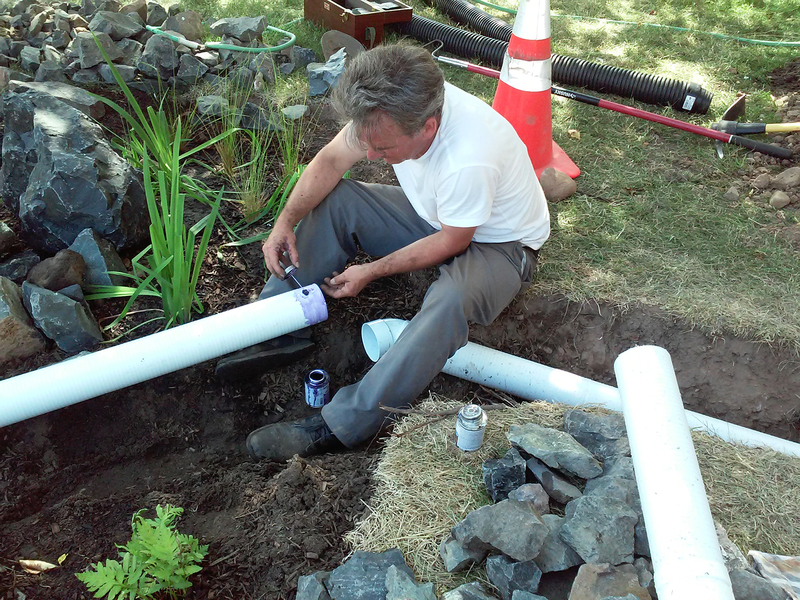 The downspout is disconnected from the storm sewer and redirected to send water into the garden. Checking the level to be sure water flows in the right direction. These brown leaves washed off the roof and down the spout during a heavy downpour. 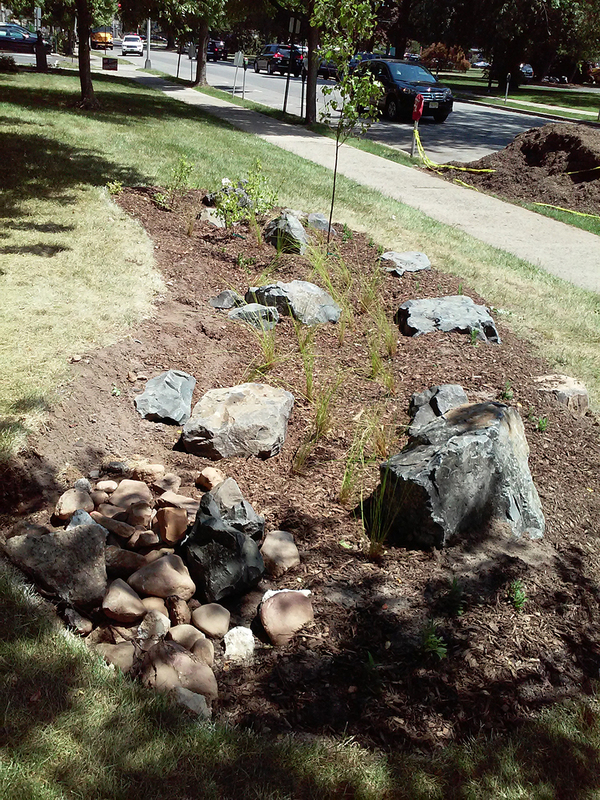 Like any garden, rain gardens need to be looked after. An overflow drain is installed that pipes excess water back to the storm sewer after an exceptionally heavy downpour. 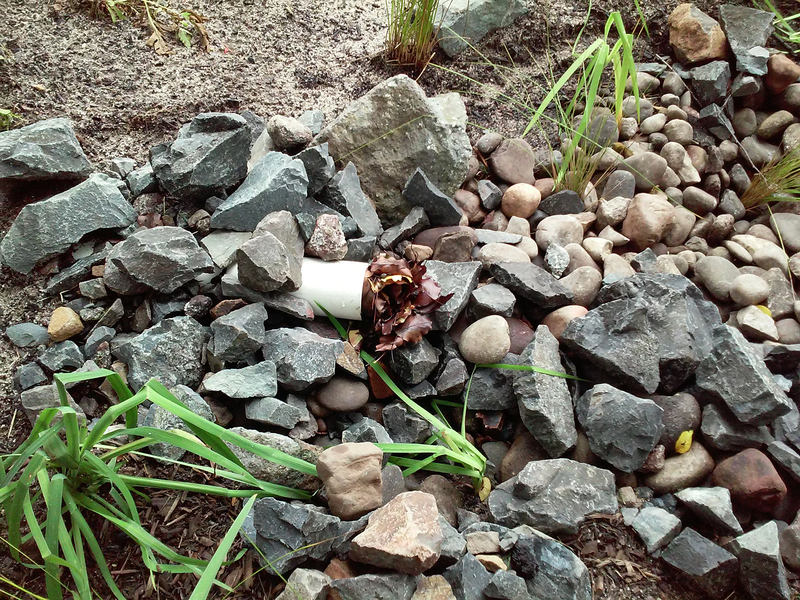 The overflow pipe is buried among the flowers. These basaltic rocks are similar to the bedrock underlying Summit. 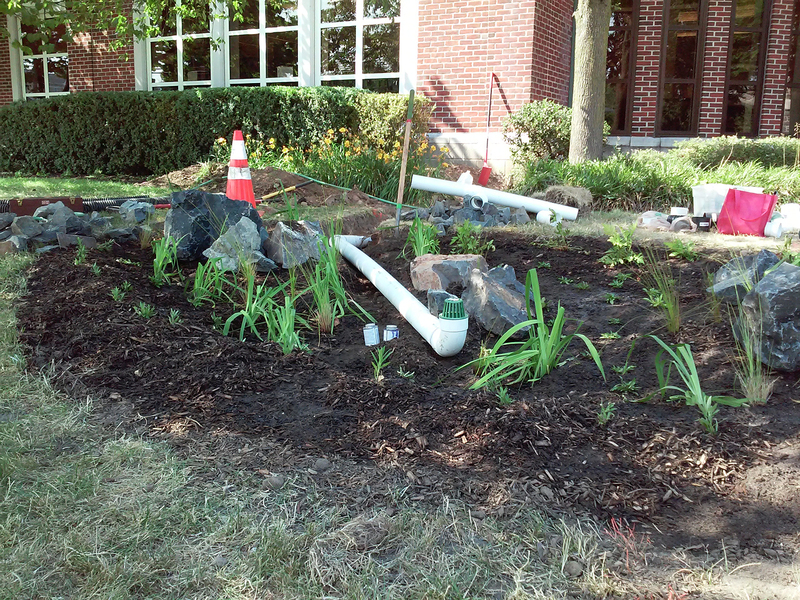 Rushes and Blue flag iris are planted in the “stream bed”. Ferns, shrubs and wildflowers are planted higher up. The entire garden is mulched to a depth of 3 inches to retain moisture between rains. Trees are wrapped in a watering bag until their roots grow deep enough to stay moist. The Summit rain gardens were designed and installed as part of the Rutgers Cooperative Extension Water Resources Program Impervious Cover Reduction Action Plan, a project focused on the Raritan River watershed and funded by the National Fish and Wildlife Foundation Hurricane Sandy Coastal Resiliency Competitive Grants Program. 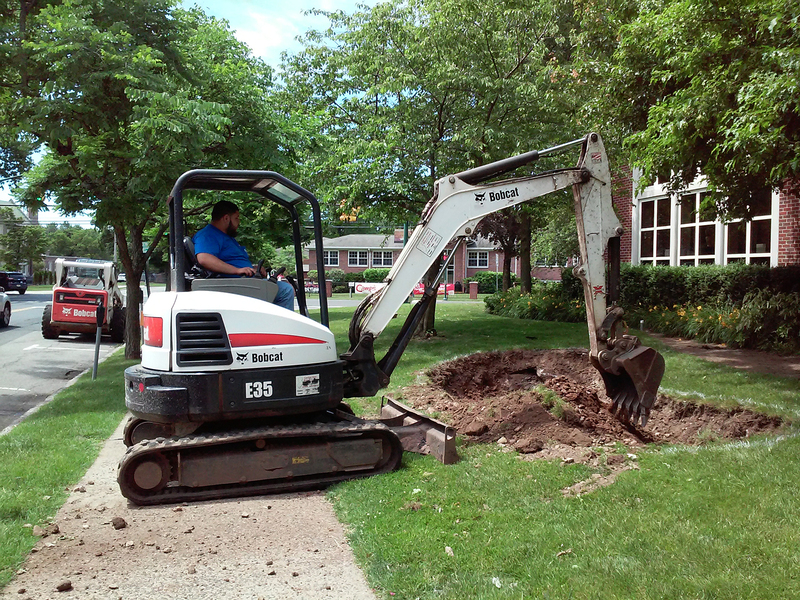 Assistance of the City of Summit Department of Community Services is gratefully appreciated. The Rahway River Watershed Association grant support from the Merck Foundation and the New Jersey Watershed Institute in part made this project possible. Here is some technical information that residents and engineers might find useful when deciding the optimal size to make a rain garden.